FILM REVIEW: Captain Marvel aims to lay heavy foundation for next phase of Marvel Cinematic Universe at the expense of a compelling origin tale. 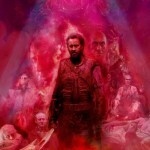 In this episode of Cult Following, the gang does a deep dive on Panos Cosmatos’ latest film Mandy and what does it mean for Nicholas Cage’s career as an actor? Is this a rebirth or a Wicker Man like derail? Review: ASSASSINATION NATION (2018) Style over substance derails an interesting & timely premise. Director Sam Levinson’s ASSASSINATION NATION is a muddled genre mishmash that works best when being a timely version of Heathers, but loses steam when trying to be a Purge-influenced parable for the modern age. FILM REVIEW: ‘Shazam!’ is a Standalone Family Comedy Superhero Film. And That’s Weirdly Refreshing. FILM REVIEW: Dumbo stumbles but ultimately takes flight as Tim Burton’s best film in years. LAS VEGAS and PHOENIX! See Jordan Peele’s US early on March 19th at Tempe Marketplace!